Car reviews, specifications auto, motorcycles and trucks > BMW > The BMW X5 battery: where it is located, how to charge, what type of it to buy, and more. It is worth to mention right from the start that the original automotive batteries on X5 are installed perfectly well. If you analyze the testimonies, you will find that these have a lifespan of 8, even 10 years, which exceeds the lifespan of all the commercially available automotive batteries with at least twice. Therefore, if there is a problem with your battery, it would be much better to charge its existing one rather than trying to change it for a new one. However, anything can happen and life is unpredictable, so we will expose a short list of questions and answers which are linked namely with this problem. Where the battery of the BMW X5 is located? It is in the trunk. You should lift the mat and look in the right side. You should also note that under the spare wheel, you will need to unscrew the plate, beneath it. How to get the access to the unit if it discharged and the trunk is blocked? 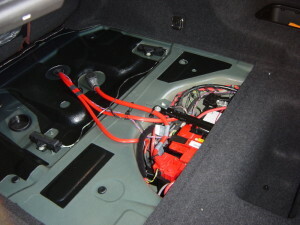 In order to recharge the battery or to open the trunk you will need to connect to the car’s electrical system. For this, on BMW X5, under the hood, you will find special terminals (pins), for connecting the external power supply (for lighting up). They are located on the left side of the direction of motion: the terminal + is placed closer to the rear part of the engine compartment and is covered by a red cap with the symbol + on it. The terminal with the symbol “—“is either one of the nuts of the left rack (the large sized nut) or this terminal is displayed separately on the left fender liner. You can read more details in the manual. After connecting the power, the car is unlocked and the battery can be recharged or replaced. How do I charge the BMW X5 battery? Most charger units have an impulse principle of action, so we recommend using it (the charger) for disabled car terminals, which means to disconnect the “weight” terminal from the battery, and only after this use the charger. The battery suddenly discharged or is recently charged. First, you need to look at the brushes of the generator; usually their deterioration doesn’t permit the charge of the battery. Which battery is suitable and where can I get the same one? For these questions you will get immediate answers and details from any seller that sells batteries. There are many models, and the price varies a lot, from 50 dollars and more. 7ista, Varta, and Bosch are suitable. For more information, you can search online for videos.